Welcome to Week 3 of the Digital Photo Organizing Challenge! 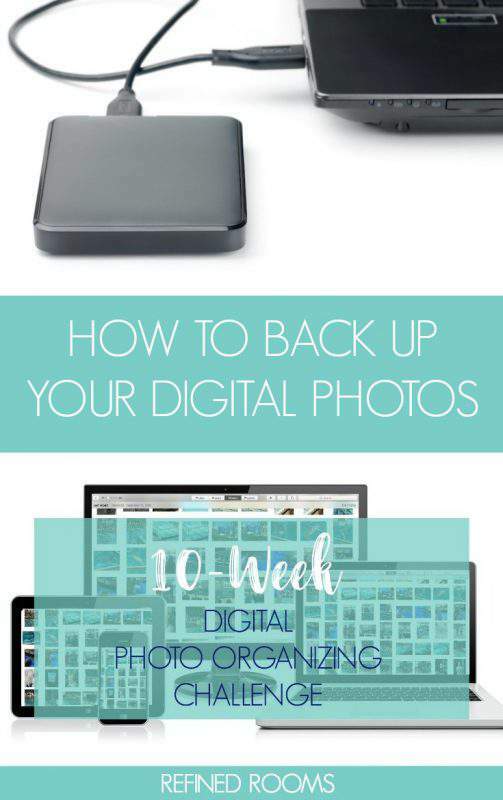 Get ready to create your digital photo backup! Exciting? Not really. Absolutely positively necessary? Yes. 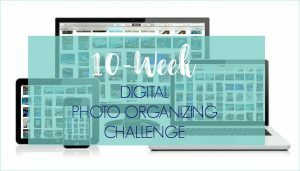 If you’re just stumbling upon this challenge, you’ll want to begin your journey to organized photo nirvana by completing the Week 1 assignment (establish a digital photo hub), followed by the Week 2 assignment of taking an inventory of your digital photo collection. Before we roll up our sleeves and dive into the nitty gritty organizational work, we’re going to complete what I consider to be the most important step in the digital photo organization process…creating a backup system. If you do nothing else during the course of this challenge, please complete this week’s assignment of putting a backup system in place to protect your digital photos. Pretty please?!? At this point in the process, I recommend completing the first two steps of the four-pronged approach outlined in that post. It’s better to hold off on signing up for a cloud photo storage service and printing your photos until you’ve whittled down and organized your collection. 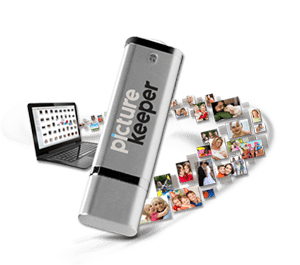 Another option to throw into the mix that can be used in addition to or in place of an external hard drive is a Picture Keeper device. Picture Keeper is a USB flash drive device that you plug into your computer, which automatically finds and backs up all of the digital photos on your computer. The Picture Keeper mobile app backs up photos on your devices to your computer. This backup solution is a favorite for the “low-tech” folks among us! Before you officially begin the process of organizing your digital photos, you should “back up the chaos”. What do I mean by that? In the photo organizing world, it simply means creating a copy of the original (disorganized) digital photo hub that you created in Week 1. “But why would I want to create a copy of The Chaos?” you ask. As you’ll soon discover in the coming weeks, it’s really easy to make mistakes when you begin the process of sorting, decluttering, and renaming your images. Having that back up of The Chaos can save your bacon if you accidentally delete images, or begin to get confused during the organization process. You can always refer to that original backup to know exactly what you started with. In the worst case scenario, you could use it to begin the organizing process all over again if you find yourself in a hopelessly confusing place at 2 a.m. (I speak from experience!). Once you’ve created a copy of the master folder that contains the disorganized photos on your digital photo hub, be sure to rename the two folders so that it’s clear that one copy is never to be touched, and the other is your working copy. Some examples of names for the “never to be touched” folder might include: “Original Photos”, “Source Photos”, “Disorganized Photos”, etc. Use names that make sense to you. Be sure to return later in the week to let me know about your progress in the comments section below! Now go forth and back up my friend! Hi Natalie! I am on Week 3, Step 3. How do I do this step: “Back up “The Mess” by creating a copy of your master folder on your digital photo hub”? I am using a Mac, under Finder and Favorites, I have the Pictures icon which is where I have all of my folders from laptops, phones, etc. (looks like what you have on week 1: creating digital photo hub). What do I do next to create the copy? Shelli — On your HUB, create a folder called BACK UP – ORIGINALS, then copy and paste each folder within your Pictures icon into this new back up folder on your hub. So excited that you’re taking the Challenge! I am wondering if I back up my “Chaos” folder to the all purpose cloud storage site I choose as well as to an external hard drive? Or if I only back up to that once my photos are in order. Thank you for this by the way! My photos are an extreme mess and I have been too overwhelmed to even know where to begin. This has been awesome! Great question Mary Jean! Since the cloud storage site automatically backs up all of your files, the Chaos folder typically gets backed up to cloud storage in addition to the EHD. Once you’re at the very end of the process and you’re confident that your newly organized PICTURES folder contains everything that you want to keep from the Chaos folder, you can then choose to delete the Chaos folder from your cloud storage. Some of my clients have chosen to keep the Chaos folder as yet another backup. If you have unlimited storage, it certainly doesn’t hurt to keep it. It’s really up to you and your comfort level. Keep me posted on how the Challenge is going for you as you progress! I agree, backing things up is so incredibly important. I’m always amazed how many people don’t have any backups. I love the Picture Keeper. It’s so easy to use. It’s part of my monthly procedures to back up all my personal pictures (and client pics too) on my PK PRO520. 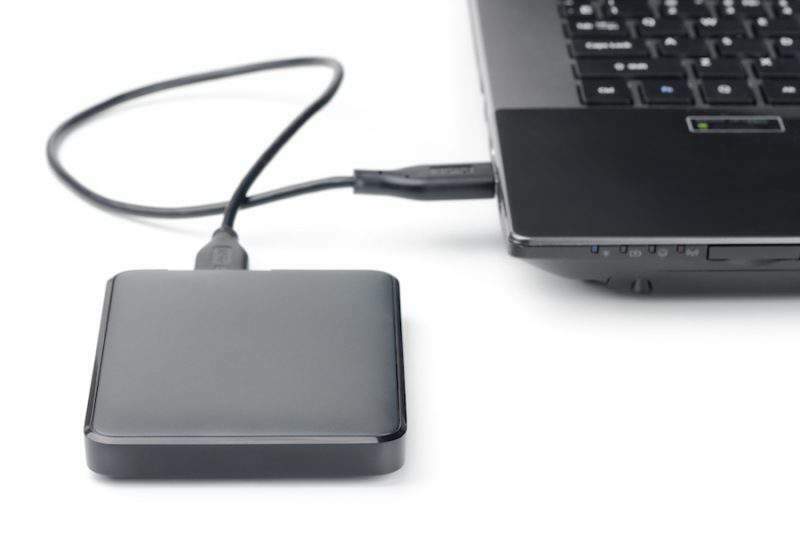 Most of my clients opt for external hard drives, but I totally agree that the PK is such an easy and quick back up solution. Thanks for adding to the conversation Andi! Thanks for the easy to follow backup tips. I wonder if PictureKeeper will be able to keep up with the sheer number of photos people have. Can a thumbdrive scale up as photo libraries grow? Natalie, you may know ths already, but You don’t have to switch out your PictureKeeper drives as your collection grows. You simply add on. When the first drive is full, no matter what size it is, it will tell you. You can then plug in a second (or third or fourth) PK drive of any size, and it will continue to backup only the new items. The original PK drive leaves some sort of PK marker on the old files, and it knows not to back them up again. This works seemlessly, both on Mac and PC. So unlike a traditional hard drive, where you pretty much have to buy all new gear and start your backup over, PK, makes this process easy for the user. My clients love it. Thanks for the clarification Darla and for joining in the discussion! Photo organizers definitely need to increase awareness of this super simple back up solution. Great information! I’ve got my backups in place but it is amazing how many don’t have any, let alone a plan. Love your weekly series! Thanks for sharing! I’m glad you’re enjoying the series Kate! Helping clients put a proper backup system in place was always the first priority in my work with photo organizing clients. Most had no system in place whatsoever.